Snow Princess and her Sister! Princesses and the birthday girl! Christina as The Snow Princess !! Enjoy LIVE singing of all your daughters favorite songs from the movie all included in you child's 45 min birthday party! The Snow Princess show also includes games, gifts, magic, autographs, makeup and photos!! Contact us for details. We have been family owned for over 23 years and will make your party sparkle. Pictures and referral's are available. From the moment they walked in, it was a fun and magical time for the kids- and us parents really could step back and watch the kids eyes light up, interacting with the princesses and enjoying themselves. My 3 year old is usually nervous and scared at first but she ran up to and hugged Christina/Elsa right away. 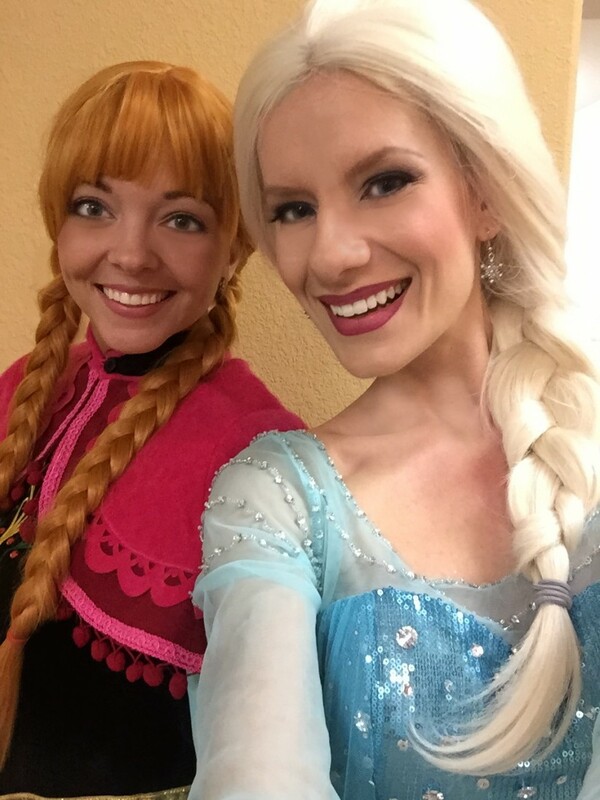 We were thrilled with both Elsa and Anna and even our guests were saying how awesome they were, live-singing and dancing and all.. thank you so much for making our daughter feel so special on her birthday! Snow princess entertained our 3 year old and her friends for her birthday party. She is a total professional, quick communication, arrived on time, looked just like the real princess and the kind just LOVED her! Snow Princesses were absolutely wonderful. The kids loved the show and were entranced. The two princesses were very warm and welcoming to the kids, and kept them entertained the whole time. I highly recommended. They were the life of the party for my granddaughter and her friends. I highly recommend them. My granddaughter wanted me to say that they made the party so so so much fun!!!! They really played the characters. Must have at your Frozen party! Christina thank you do much for turning my daughter's 2nd Birthday into a beautiful memorable event. We had planned on 10 kids but only a few showed. Alyssa was not bothered at all because she had the best guest she could ever ask for there and really that's all that mattered to her. The Snow Queen " Christina" truly is the best. She sang all of my little girl's favorite songs and made her feel so important on her special day with undivided attention. The Snow Queen gives and amazing performance no matter how small the crowd. There were more adults than children in attendance and everyone was entertained. Thank you again so very much. We will cherish the memories. Christina the Snow Princess is the best Elsa there is in Vegas. If you are looking for perfection for your party she is it. Book her for your party she is amazing!!! The snow princess recently performed at my daughters birthday. She did an excellent job keeping the kids fully engaged the whole time. They loved singing with her and getting their make-up done. My daughter was so excited that ELsa gave her a birthday present!! I highly recommend the snow princess. We just had Snow Princess and her sister at my daughter's 3rd birthday party. They were fantastic, and the kids loved them! Both actually have lovely voices and great performance ability which was commented on by several of the parents. I would highly recommend them. A magical frozen moment with Queen Elsa! Christina was very professional from the very first time we communicated. She came to the event on time and managed to surprise my little one. My daughter was so happy the whole time with her. Without breaking into character, she was able to manage all the little ones with ease and truly accommodated my daughter throughout her entire show. I am so thankful for having Queen Elsa be part of a memorable occasion. Highly recommended to all my friends and others and looking forward to using her again for future parties!!! Great princess, inside and out! It was such a pleasure to work with the snow princess! She is so outgoing and wonderful with kids. She came as "Elsa" to my daughters 6th Birthday. She was on time and fabulous with the kids. She took pictures, signed autographs,sang,danced,put on make and sparkles and even did a magic trick. My guests were very impressed. I can't thank her enough! Snow Princess was absolutely professional and prompt as she promised she would be, and the girls just loved her. She was our daughter's favorite part of her celebration. And now she's a big hit with her friends at school too! Snow Princess was amazing with the kids; they absolutely loved her. She always had a beautiful smile on her face, was completely genuine as a person and was completely believable to the girls. They truly believe she is actually the real princess. She was very kind, loves children and enjoys what she does. She sang beautifully, performed perfectly and really engaged the girls; she had their complete attention for an hour. The photographs prove she had the girls totally mesmerized and in awe. And the huge grins and smiles she caused, even on the faces of the parents, were priceless. She is also quick to respond and communicate, easy to get along with, has a naturally bright and cheery disposition and is very kind. 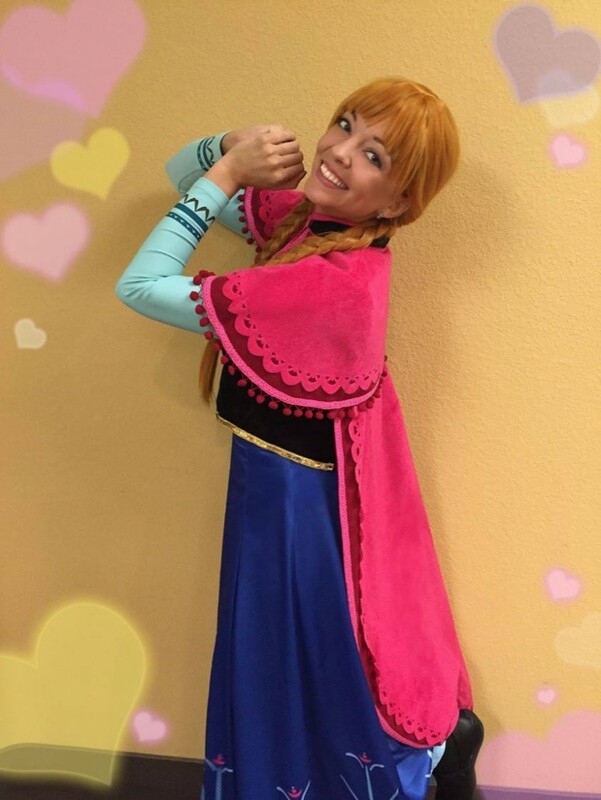 I would absolutely recommend Snow Princess for a party; it is completely worth the smiles you are rewarded with (and the parent worship you will receive for getting her to show up for your party)! We are very grateful to her and would definitely hire her all over again. I booked Christina kinda last minute for my daughter's birthday party... Frozen theme'd and she was very professional and prompt to reply. She showed up on-time and wow looked amazing... very realistic Princess Elsa comes to life. She has a wonderful voice and is great with the kids... she really has a way with them. They were mesmerized as were the parents who all gave me a big thumbs for having her to the party. If you're looking for a snow princess look no further.. you won't be disappointed! Christina has been performing in the children's entertainment business since she has been 11 years old. She portrayed Skipper and assisted Barbie for birthday parties all across the Philadelphia area! in 2000 Christina started performing at parties as Britney Spears, Hillary Duff and Hanna Montana! Christina knows how to keep your children entertained for the duration of her stay at your party with non stop action that will have the kids wanting more! Disclaimer: It is not the intention of Many Faces Entertainment to violate any copyright, trademark, or licensing laws. Our characters are generic and not name brand copyrighted characters. We only accept party bookings from our customers who are fully aware that we do not represent any licensed character. We provide look-alike characters only. If you are requiring a licensed, copyrighted character for your event, you should contact the company/copyright holders.